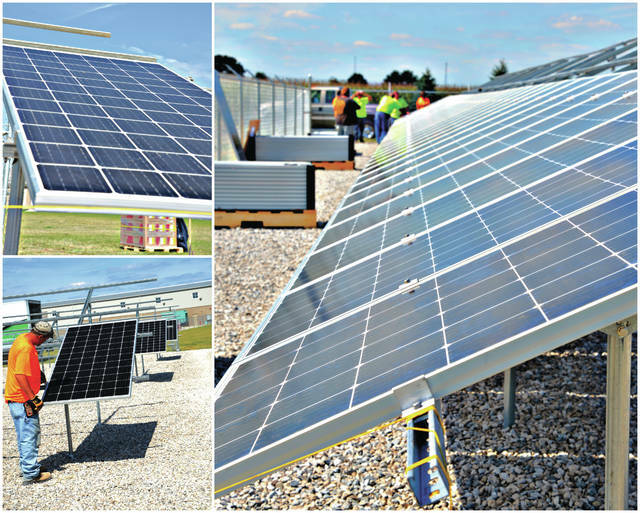 On State Route 521 near Kilbourne sets an array of 304 solar panels just waiting for a clear day to harvest the rays of the sun to manufacture electricity for the members of the Consolidated Electric Cooperative. These photos were taken when the array was being assembled. 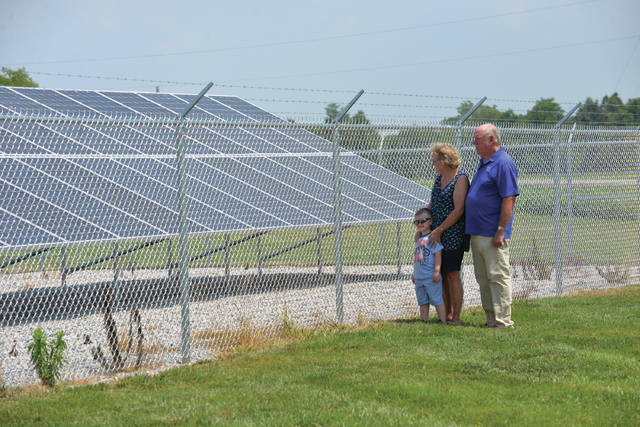 Courtesy Photos | Consolidated Electric Cooperative, Inc.
Donna and Bill Cackler show their grandson, Grayson, the large solar array along State Route 521. The Cacklers are members of Consolidated Electric Cooperative and participate in the co-op’s solar program. Members of the Consolidated Electric Cooperative, Inc. don’t necessarily want a lower rate for electricity generated by the large array of solar panels on State Route 521, but they like the idea of a renewable energy source. According to Consolidated’s website, in a year’s time the power produced by the 304 panels offset 229,722 pounds of carbon dioxide emissions, powered 1,363 lights for a year, and 260,352 miles driven in a car. Consolidated is a full-service energy provider serving the energy needs of the 14,000 rural members of north-central Ohio with electricity, propane, and soon optical fiber cable. Consolidated is a member of the Ohio Rural Electric Cooperatives, a statewide trade association of 24 cooperatives in Ohio. The co-op’s membership once only consisted of farmers, but as more people moved from the cities to live in the rural areas, homeowners outnumbered the farmers. Hawk said Consolidated Electric Cooperative, a nonprofit, member-owned and controlled cooperative, was created when Morrow Electric Cooperative and Delaware Rural Electric Cooperative merged in July of 1996. Hawk said when the co-op surveyed its members on the idea of solar power, it found that 50 percent of the membership was in favor of a solar program. “We were astounded to how many of our members wanted this,” she said. Ebersole said when the co-op considered offering a publicly-owned solar program officials figured they would need to generate about 25 kilowatts of power for their membership. Ebersole said the program is for members only. Ebersole said when the program was started members were limited to only five panels at a time, but when there were a few leftover the co-op upped the limit to 10. He said that all of the 304 panels have subscriptions. Both Ebersole and Hawk said as technology advances the panels become less expensive and there could be a day that members are saving money over the traditional electric rates. https://www.delgazette.com/wp-content/uploads/sites/40/2018/01/web1_oursolar1-copy.jpgOn State Route 521 near Kilbourne sets an array of 304 solar panels just waiting for a clear day to harvest the rays of the sun to manufacture electricity for the members of the Consolidated Electric Cooperative. These photos were taken when the array was being assembled. Courtesy Photos | Consolidated Electric Cooperative, Inc.
https://www.delgazette.com/wp-content/uploads/sites/40/2018/01/web1_DonnaandBillCackler.jpgDonna and Bill Cackler show their grandson, Grayson, the large solar array along State Route 521. The Cacklers are members of Consolidated Electric Cooperative and participate in the co-op’s solar program. Courtesy Photos | Consolidated Electric Cooperative, Inc. This entry was tagged Consolidated Electric Cooperative, delaware, Electric, energy, ohio, Solar. Bookmark the permalink.